When the Wrobel’s booked me for a summer family session I vividly remember thinking “I cannot wait to see their outfits!” Sisters, Jessica and Evelyn have been style icons in my mind since the day I met them, so I knew they had this one in the bag! 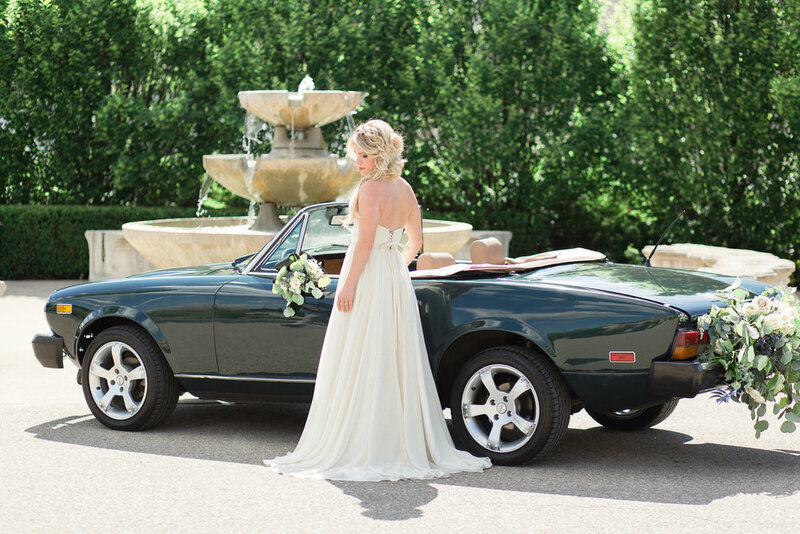 Styled to perfection - with an outfit change to boot - this sweet family did not disappoint! 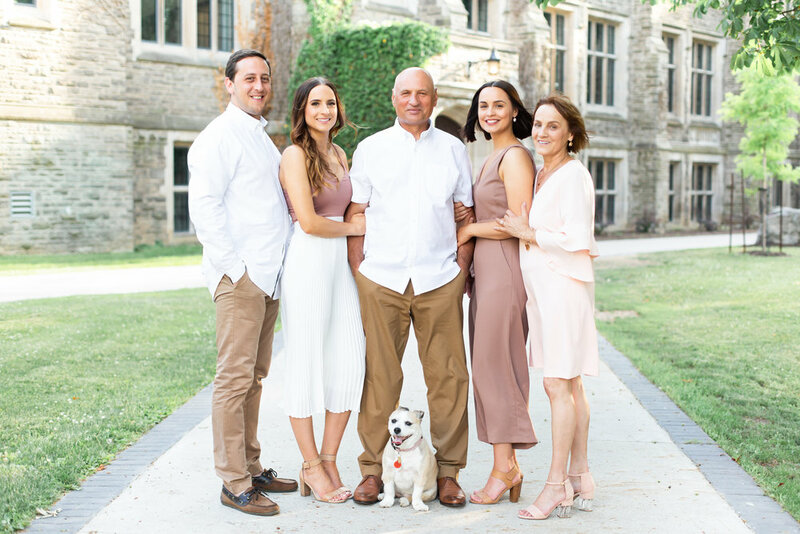 McMaster University served as the perfect backdrop for this session. We spent the better part of an evening walking the grounds of campus while stopping for photographs along the way. Our time together was spent full of laughs, jokes and smiles, a photographers dream! 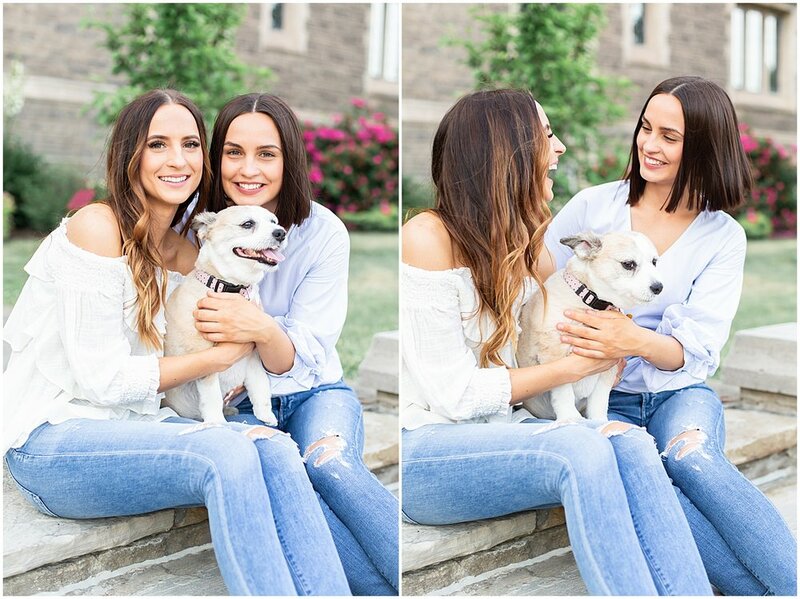 Though I was sad when our time came to an end, it was bitter sweet as Evelyn and Remo (the two cuties on the right in the image below) tie the knot this summer and I will be there to document their special day and reunite with this incredible family once again! These sessions are geared towards individuals looking for fresh content to up their game! You’ve got big vision, a new direction, maybe a new — or refined — message that you want to deliver to the world. This is for you! Your website and social media visually tell the story of who you are to the world. To market and advertise yourself or business, high-quality images aid in positioning yourself as an expert and presenting people with an authentic brand experience. Whether you’re a coach, online entrepreneur, influencer or speaker, iconic photography can take your brand to the next level. A $100 non-refundable deposit is required to secure your time slot, with the final payment due on the day of your branding session. Reach out to info@alexandradelbellophotography.com for more details and to secure a session time. Where will my session take place? Sessions in April will take place in a bright, spacious and modern home located in Newmarket. We will have access to multiple rooms including kitchen, dining room, living room, bedroom and office space. Sessions held in June will take place in a cozy apartment located in downtown Hamilton, boasting white walls, exposed brick and lots of natural light. 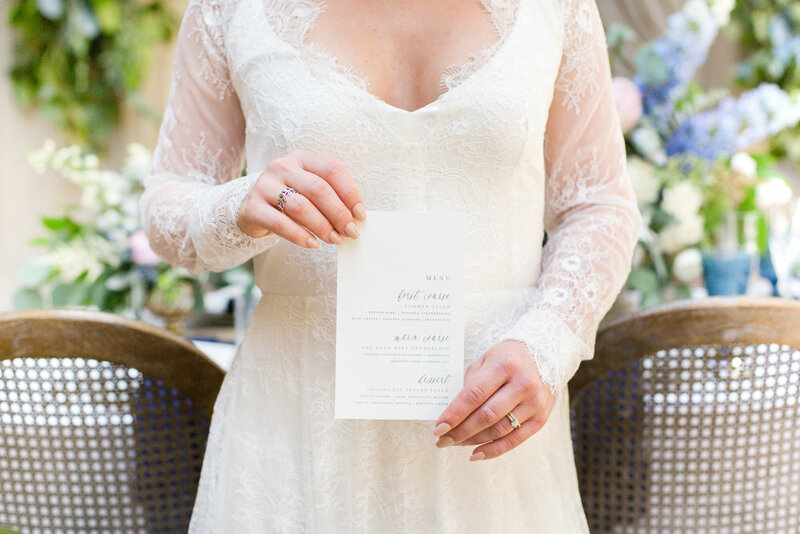 A document will be sent straight to your inbox which will walk you through the process of choosing your outfits, advising what photographs best. When will my images be ready? You can expect to receive your final images within 10 days of your session date. If you would like to receive your images sooner, a rush fee can be applied for $100 which will ensure your images are complete within 3 days after your session date. Images will be delivered through an online gallery system. Once you session has been edited and the images are ready I will send you a link to your online gallery. From there you can download the entire gallery or individual images in high resolution. This is the first year I will be offering spring mini sessions. If you are looking for updated couples, family, portrait, newborn or maternity images at a reduced rate this is for you. Limited availability - don’t wait to book, snag a time slot now! Reach out to info@alexandradelbellophotography.com for more details and to book session times. What defines you as a couple? Silly, adventurous, active, nerdy, romantic? Would you enjoy cycling around Niagara-on-the-Lake together through Vineland, or prefer to take a calm walk by the pier at sunset? Determining who you are as a couple can help to set the tone for your engagement session and make planning locations and activities that much easier. When possible, I encourage couples to choose locations that are of significance to them. The place you first met, the spot he proposed, or even a hobby that you both enjoy together. Engagement photographs are about capturing who you are as a couple at this particular time in your lives. Choosing something unique will aid in making your images more authentic and meaningful. 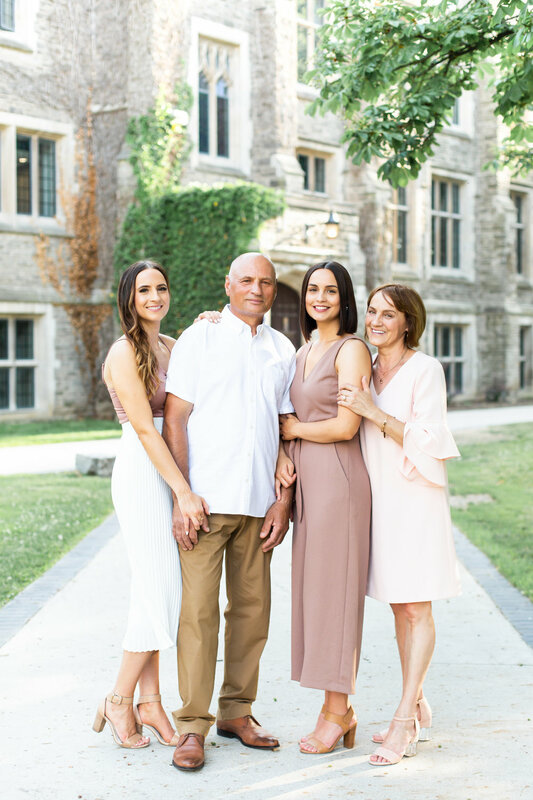 Jolin and David took this advice and ran with it as they chose to incorporate some of their favourite pastime activities into their summer engagement session… picnics and doughnut munchin! 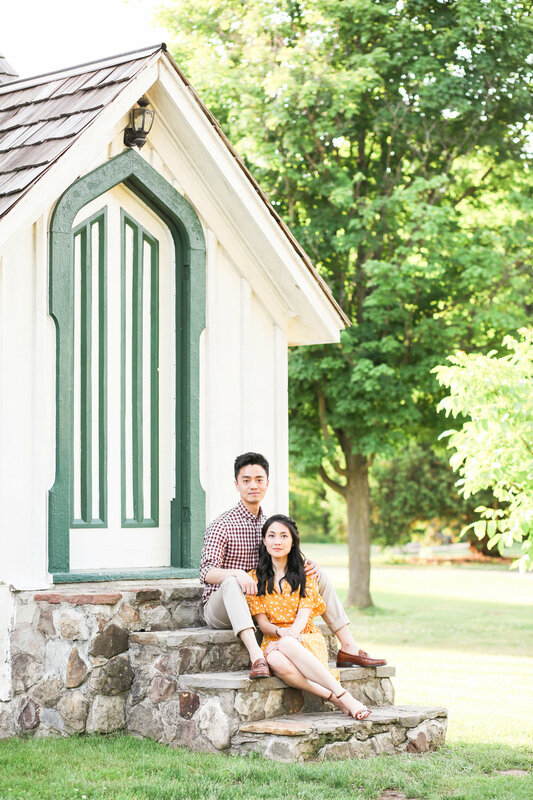 Their session was captured on the grounds of Balls Falls, in the Niagara region, where we spent the better part of a warm summers evening exploring the park and ending the day with a picnic, complete with Beechwood doughnuts and sparking wine. 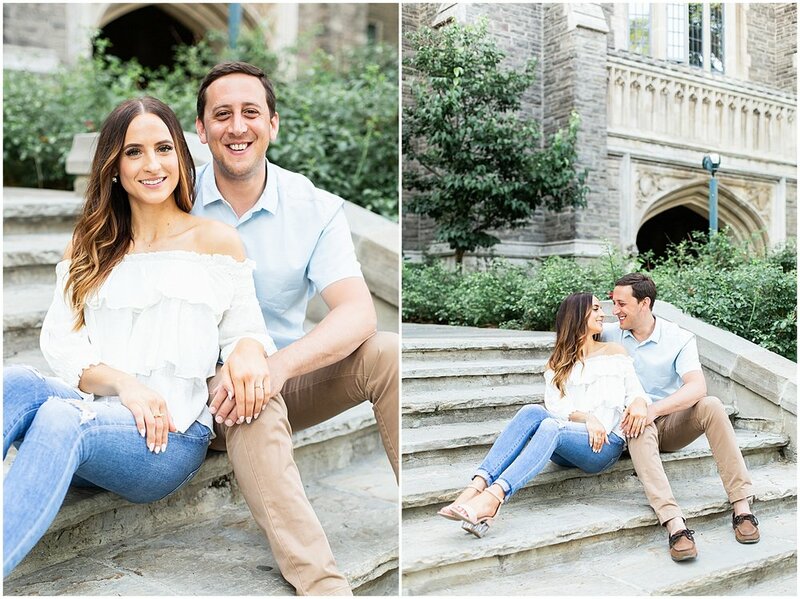 Here are a few of my favourites from their sweet engagement session! I am so excited to announce the release of 2018 fall mini sessions. These quick, fun lifestyle sessions are such a blast, I look forward to them each year! If you are looking for updated anniversary, family, portrait, newborn or maternity images at a reduced rate this is for you. Limited availability - snag a time slot now! The images from our Something Blue Styled Wedding Shoot have been vaulted deep within my external hard drives until last week when the entire shoot in all of its beauty was finally featured on Artfully Wed. Now that the images have gone public I figured it was about time to share my absolute favourites from this shoot that came together beautifully last summer. 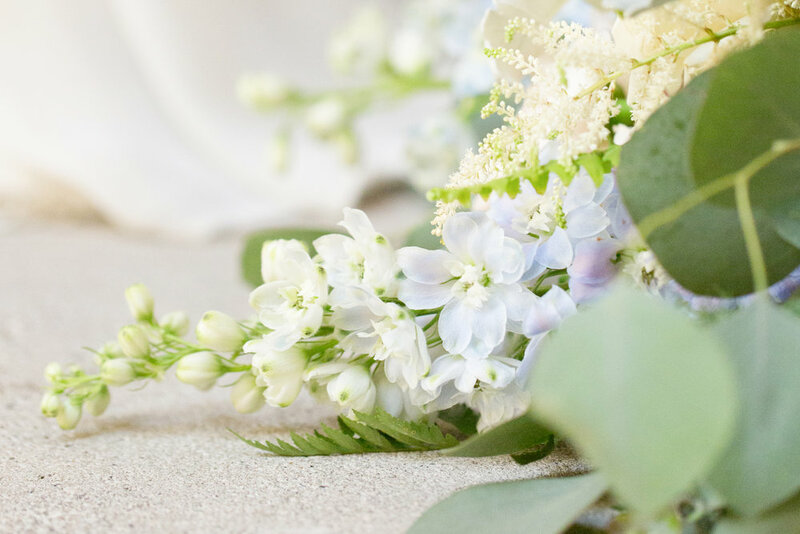 Although planning and executing a styled shoot in the midst of wedding season was a hustle, thanks to an incredibly talented team of vendors and assistants this shoot turned out better than I could have ever imaged! 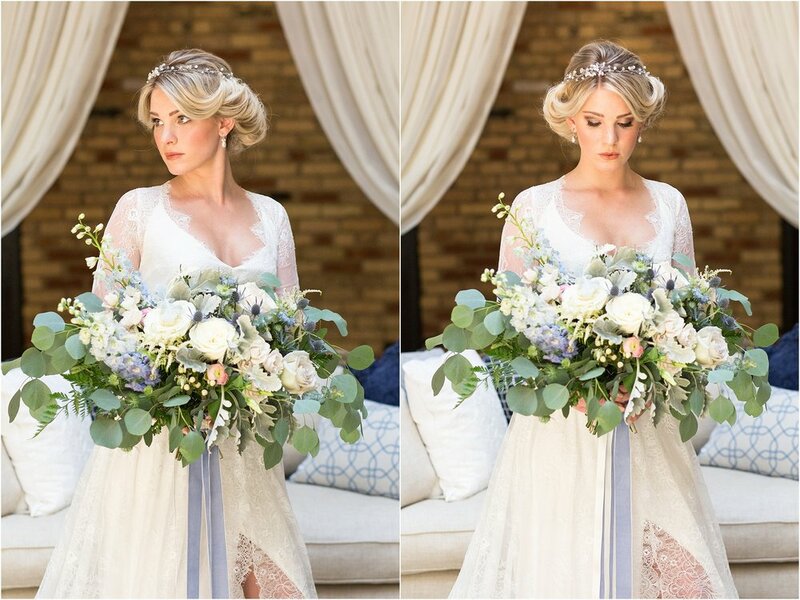 The inspiration for this styled wedding shoot was taken from the long standing “something blue” bridal tradition. 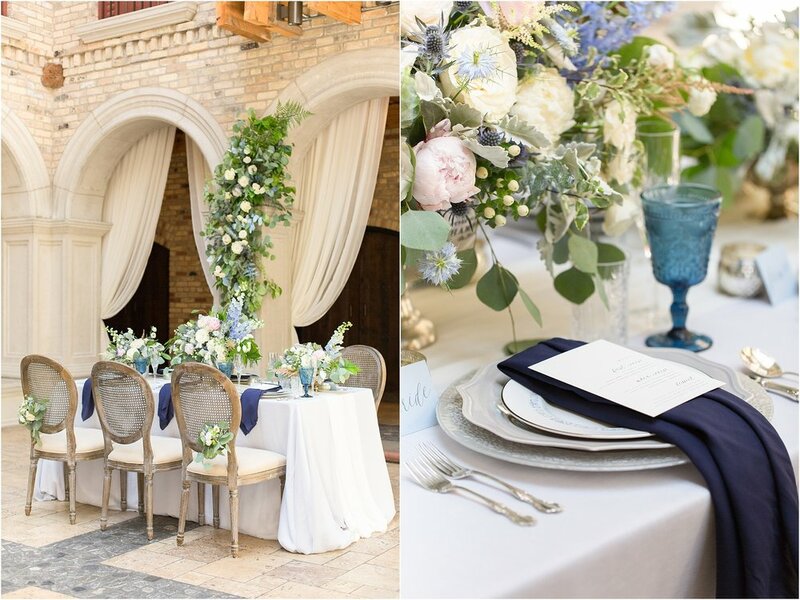 Soft pewter and sky blues mixed with pops of royal and navy tones were integrated into the colour palette for the majority of décor, florals and accessories. 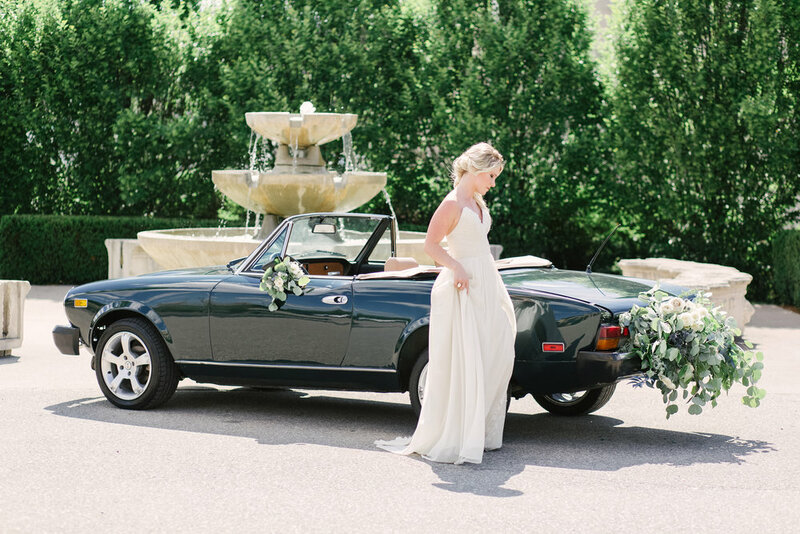 Aiming for a soft, romantic, European elegance, Hacienda Sarria, a wedding venue inspired by the Spanish “The Road to Santiago de Compostela” walk, was an obvious choice to host the shoot. The venue, located in Kitchener, Ontario emulates a European feel with its Spanish style architecture, stone masonry and wooden doors. Our beautiful bride Ashley, (recently married and now reliving bridal bliss) modeled not one but two stunning gowns supplied by Sash & Bustle. The first was a set by Claire La Faye, which included an ivory slip, emery lace overlay and whimsical tulle skirt. The second dress was a Truvelle gown complete with a flirty front slit lined with soft lace. 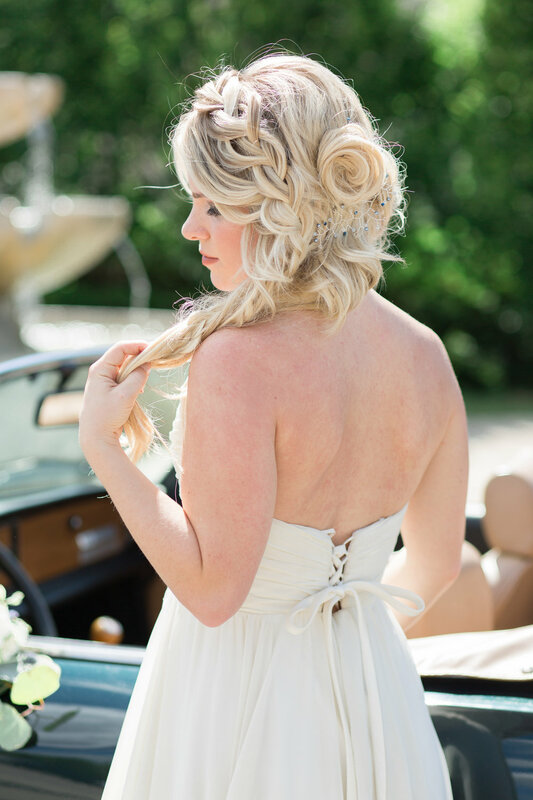 Vintage inspired custom headpieces created by Frilly Bits enhanced each bridal look. The floral designs that were flawlessly executed solidified my firm belief that there is nothing Blooms & Bliss can’t do! 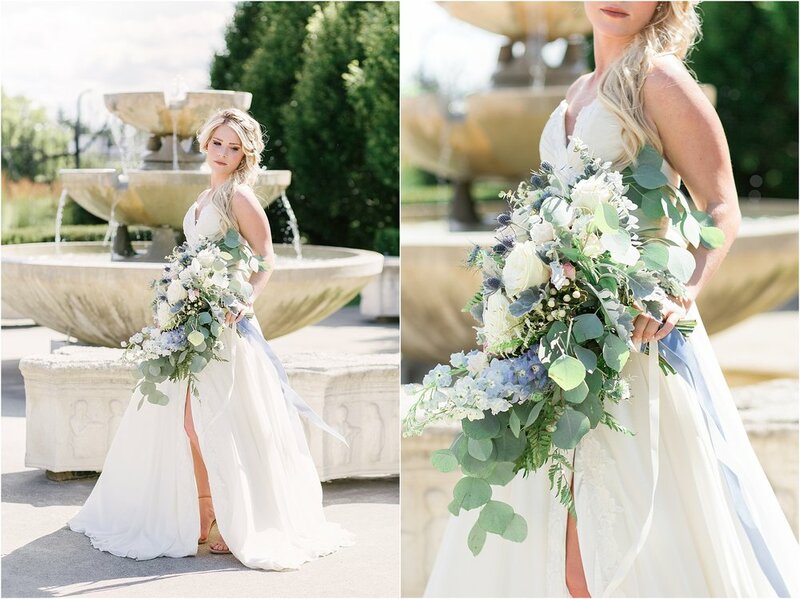 The florals completely transformed the shoot and tied everything together seamlessly. The eye catching asymmetrical floral arch commanded attention, while the striking bouquet took each bridal look to the next level! 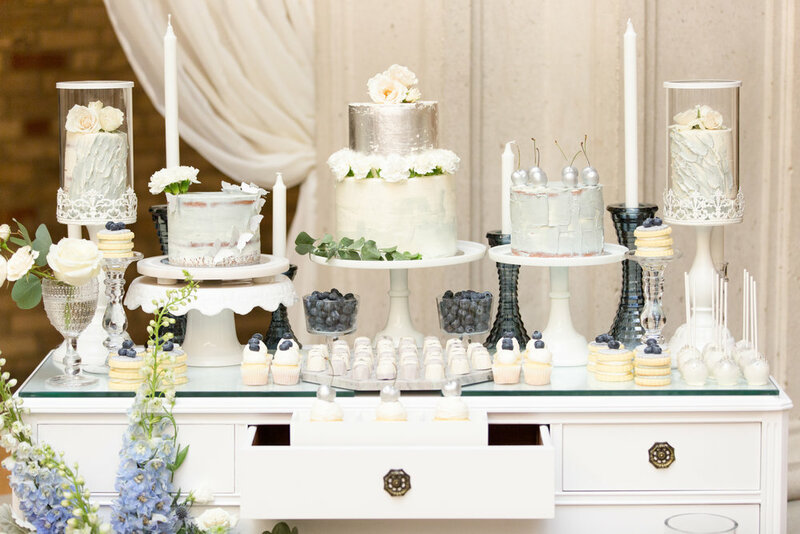 The entirety of the impressive dessert table was created and designed by DessertGardenXo. A variety of of treats including cakes, chocolates, cookies, cupcakes, and cake pops adorned the table - it was hard not to get caught staring (and or salivating) in the direction of this incredibly sweet display. The inclusion of blueberries to further tie the colour palette together was a perfect choice. Last, but certainly not least, the invitation suite, stationary, menu and place cards were designed in full and printed by Simply Sealed. The delicate stationary tied in perfectly with its timeless details such as the wax seal, calligraphy, venue sketch and matching stamps.